Does anyone else have arguments with their spouse over home improvement projects? If so, I'm pretty sure I know how you feel. Men Are From Mars & Women Are... Always Right! Trying to get husband and wife on the same page about their priorities for a remodel is rather interesting. One wants to spend more, one less. One wants to concentrate in the kitchen, the other wants to do the bathroom. One wants lots of color, one wants none. Obviously this project is mine, you know. After all...It's my master bath. I guess I should go ahead and introduce my husband: He's an engineer. He’s analytical, practical and has to have a spreadsheet for everything. Well, as I'm sure you can imagine...I’m totally the opposite. Now I’m not going to go into details as to how I got my way - that’s for another time. Let’s just say those leaks were getting really bad and the carpet was getting really stained - especially when my niece came to visit and painted the bathroom with my waterproof mascara. Now, I’m not endorsing spousal discord as a method to getting your way, it’s just that this is my business, and I wanted to take pride in what I did. I'd be able to show it off as some of my work and live in a space that I totally designed. You understand my rationale, right? You’re nodding in agreement, aren't you? You see those pictures up above? That was my average, ordinary bath, and I wanted to transform it into something really special. I’d waited a long time to do this and I wanted to get it right. The door to the toilet room opened in to that room and was impossible to close once you were in there. You actually had to stand over the toilet to shut the door! Those tiny double doors at the entrance...annoying. One was always locked and I’d run into it in the middle of the night. That tiny little linen closet built with sheetrock walls -- about 12” deep inside -- didn’t store much at all. Next, I simplified the room's layout, squared off the space and built-in some great storage - like the deep medicine cabinets and tall new linen cabinet. The leaking, single-pane window -- the one that was seated below the tub deck -- was replaced with a new rain glass, double-pane window. I made sure it was properly reframed and installed. The shower also had to be gutted, because some carpenter ants had found a nice, moist, undisturbed place to live under the shower pan. I made sure they were properly annihilated. The furr down over the vanity was removed, and ducting was rerouted in the ceiling to accomodate the new arched furr down the wood frame in the mirror. I created a focal point -- my walnut vanity -- directly across from the entrance and stained it dark to contrast with the light space. I designed deep medicine cabinets with outlets inside to keep the counters clutter free. (I love wearing long necklaces and now have a nice cabinet to store them in.) My linen cabinet at the entrance that has a single, wider main door now has more cubic feet than it did before. 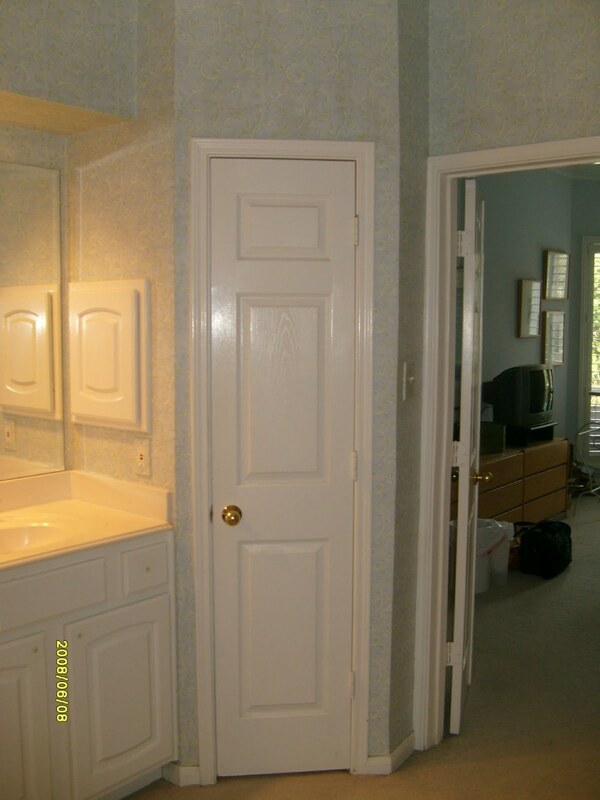 The location creates a small vestibule that you walk through as you enter the room. I wanted simple cabinetry with very little detail. I like full overlay cabinet doors -- they're so neat and tidy -- with just a small reveal separating the doors and drawers on the face. Full extension glides and Euro hinges make for clean detailing and ease of use. The mint green granite was my starting point for the finishes. I just loved the color and the lack of grain and veining. I wanted the tile to have the variation and interest, not the countertop. Beautiful glass tiles from Walker Zanger add so much to this bathroom. They remind me of the seaglass I picked up on the gravel beaches by our home in Norway. The pebbles from Daltile feel so great underfoot in the shower. I mounted the Santec faucets on the wall - Love that! 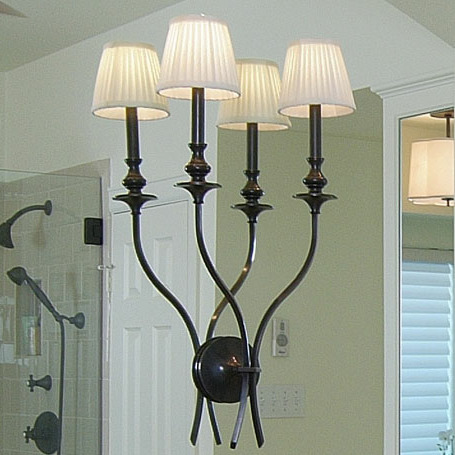 The double sconce from Hudson Valley Lighting was placed on the mirror to reflect more light into the room and add some graceful curves. I had the walls, ceiling, mouldings, doors and cabinets all painted the same color: SW Queen Anne’s Lace. It’s a soft color that appears one way during the day and differently at night. I love colors that are more complex and hard to identify. Painting everything the same color helps the beautiful tile and walnut vanity stand out, ultimately making everything feel less busy, visually, thus expanding the space. 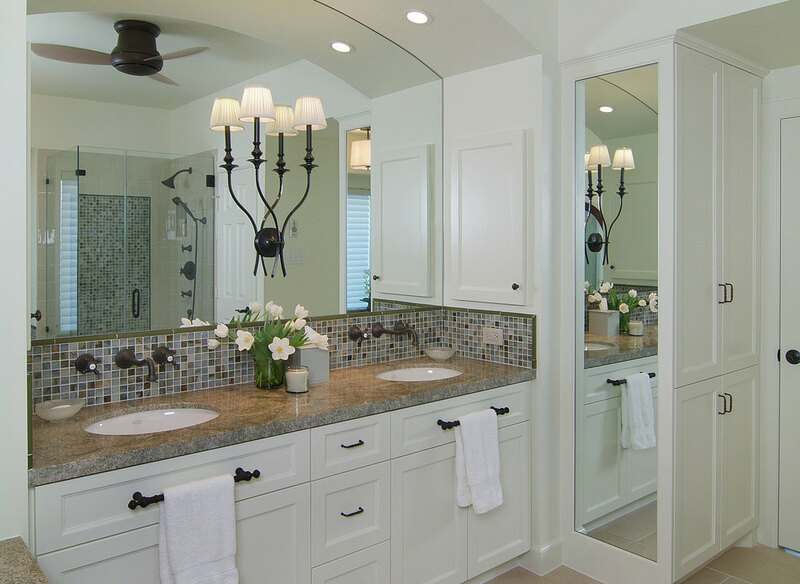 The functionality of this bathroom increased tenfold because of the remodel. The spa-like ambience and light / crisp feel is so refreshing. I couldn't be more happy with the outcome, and I’ve been enjoying it ever since.